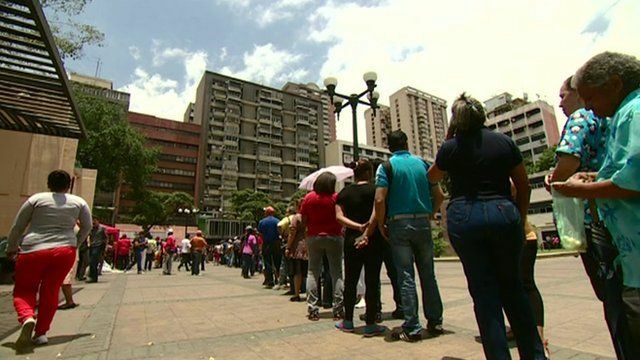 Spending the day queuing in Venezuela Jump to media player Venezuela has the biggest oil reserves in the world, yet its economy is in crisis. Venezuela economy: The mechanic Jump to media player Venezuelan mechanic Enrique Moreno talks about the impact of falling oil prices. Venezuela economy: The housewife Jump to media player Venezuelan housewife Eugenia Martinez explains how falling oil pricess has had an impact on her life. Venezuela's Hugo Chavez dies Jump to media player Venezuela's charismatic and controversial president Hugo Chavez has died. Venezuela has the biggest oil reserves in the world, yet its economy is in crisis. Widespread shortages and spiralling inflation are fuelling popular discontent, President Maduro blames the fall in oil prices and interference from the US. Last month tensions rose further when President Obama imposed economic sanctions against seven Venezuelan officials. Ian Pannell reports from the Venezuelan capital Caracas.